The product is intended for skin suffering from acne. 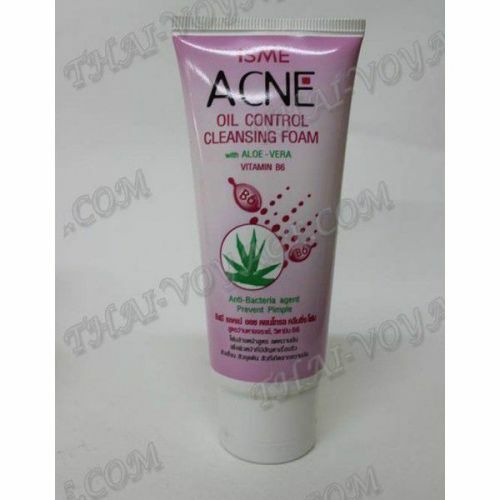 Antibacterial Foam with natural extracts of herbs and plant containing in its composition vitamin B6, which is very good for acne (acne), and seborrheic dermatitis, reduces the oiliness of the skin. It also contains triclosan - an element that contributes to the destruction of microbes and cleanse the skin. Part of the foam aloe vera extract moisturizes the skin, restores and renews skin cells, preventing premature aging and aging of your skin. The skin becomes smooth and soft. Foam is very economical in application! After its application, your skin is clean and soft. Do not dry the skin! Application: squeeze a small amount of foam to wet hands. Beat to a foam finger. Apply it on your face. Massaged for 5 minutes. Rinse with water. Composition of the product Water; Myristic acid; Palmitic acid; Stearic acid; Butylene glycol; Sorbitol; Potassium hydroxide; Glycol distearate; Sodium laureth sulfate; Parfum; Triclosan; Propylparaben; Methylparaben; Tetrasodium EDTA; Pyridoxine HCl; Aloe barbadensis (Aloe vera) leaf juice; DMDM hydantoin; Diazolidinyl urea; Disodium EDTA.